Who are more minimalist than the Amish? 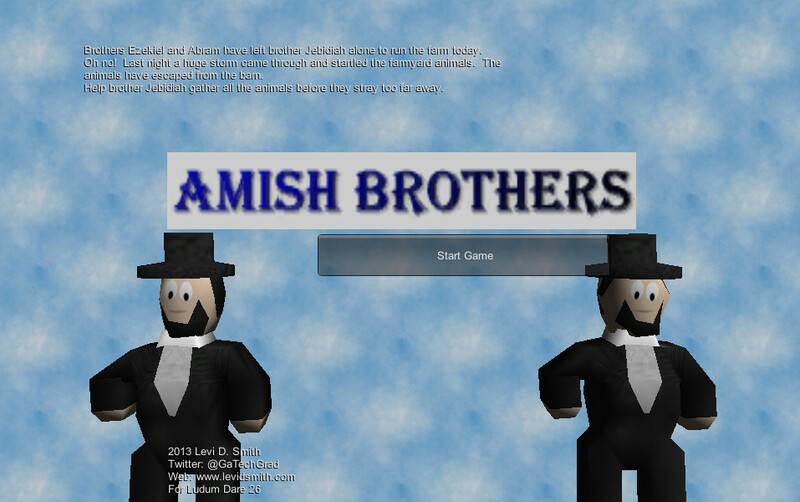 Welcome to Amish Brothers where you play as Brother Jebidiah, who must return all of the farmyard animals to the barn. Ten levels of sheep catching action! 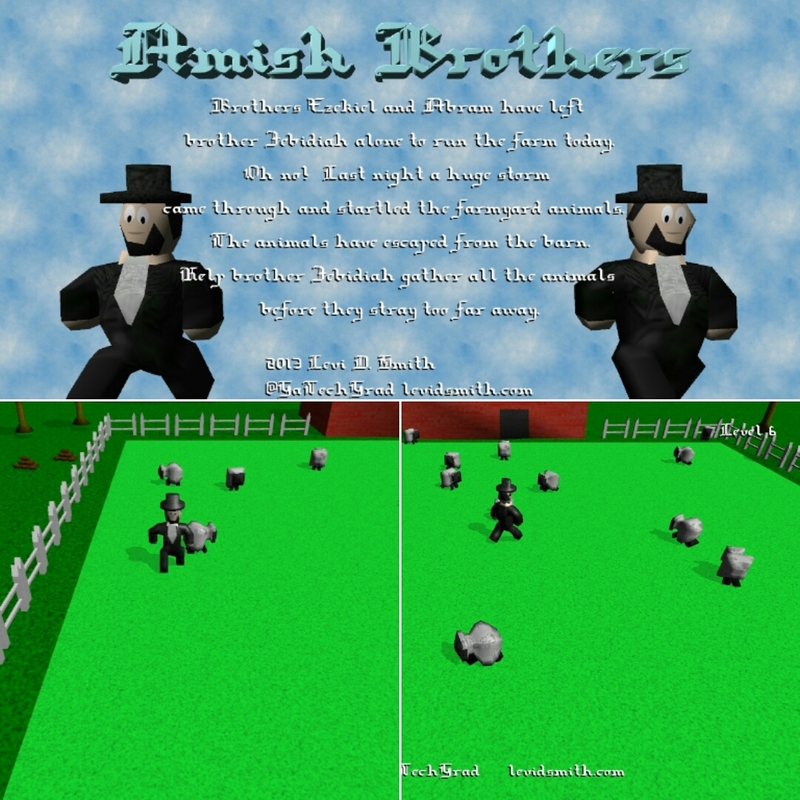 Amish Brothers was my submission for the “Minimalist” theme for Ludum Dare 26. It all started on a rainy Friday night. Ludum Dare. He wasn’t your typical programming competition like your Google Code Jams or your Top Coders. He was a loner that walked to the beat of a different drum. Now old Ludum Dare has been around these parts twenty-six times, and each time he brings along a different theme. This time his theme of choice was “Minimalism”. Ludum Dare walked into the bar and stared down all grizzled patrons, and challenges all to match his theme. Many men have tried and failed, only to return to a life of sorrow and desolation. So when I heard that the theme for this years Ludum Dare was Minimalism, I immediately thought of an episode of the radio show Coast to Coast AM with Art Bell, where the episode was on minimalist societies. There are many who follow the minimalist lifestyle today, by using only the bare necessities to get by in life. However, the original practitioners of the minimalist lifestyle are the Amish. 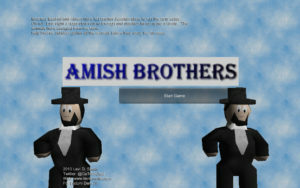 I started thinking and realized there has never been a video game about the Amish before, at least as far as I’m aware. Then I remembered the 90’s classic song Amish Paradise by Weird Al Yankovic. This could actually be an interesting premise for a game. An Amish that would save the world using only the bare necessities. The next question is how would he save the world. Obviously an Amish would not want to hurt or kill anyone, so I decided narrow the grandiose premise of the game. Instead of the protagonist attacking others, he would be helpful. For Ludum Dare, I knew that web is the platform that could reach the most players, so Unity was the best environment to develop a game for this competition. Not knowing anything about Unity, I started watching as many tutorial videos I could the night before the competition to give me a basic feel for using the tool. Even though I’m not a Unity guru, I’ve been programming games in my spare time since around 1995. My first epic game was Mystic Sword written in QBasic on my 386. Since then I have written games using libraries such as ClanLib, SDL, and most recently XNA for XBox Live Indie Games. Last year I released my first published game called Resistor to the masses on the XBox Live Indie Game platform. While it was praised by many XBox Indie review sites, I failed to make any monetary return since it didn’t sell enough copies to get the minimum payout. I decided to start working on a new game called Blasting Bits, which would appeal to more gamers. I worked on this platformer in my spare time for about six months, then an unexpected event occurred in my life, which made me lose my enthusiasm of developing games. However, I knew I still wanted to do the Ludum Dare competition this time, since I’ve never done it before and it seemed like it would be fun. So after my crash course in Unity, I knew enough to move an object around and how to detect an event when that object collided with another object. Hey, that sounds like enough to make a game! Not enough to make a deep and sophisticated game, but enough to make a simple collectible game. Then I decided that the hero, who I named Brother Jebidiah, would collect sheep… because sheep are cute. After sleeping on it for a night, I thought of a simple story about the farmyard animals escaping the barn. I had planned to include other animals such as chickens, cows, and goats, which would have unique characteristics and travel patterns, but I didn’t have enough time to implement those so I stuck with sheep. I also considered adding powerups such as a butter churn to make the player run faster, but that idea got left on the cutting room floor for the sake of completing the game on time. 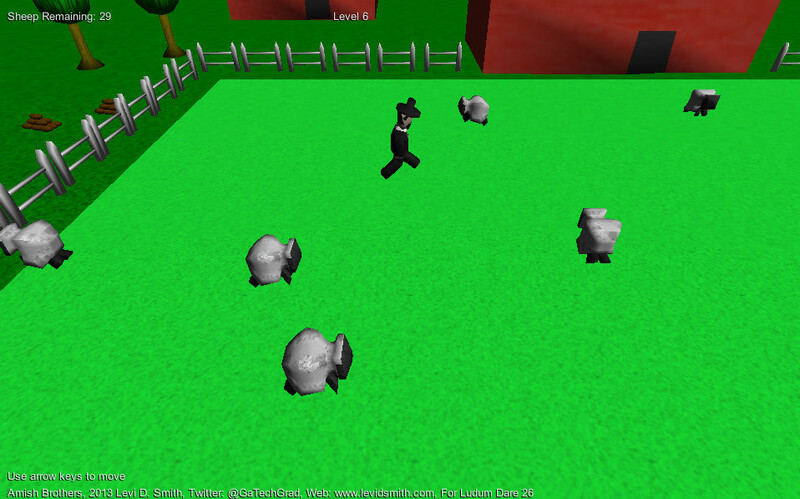 I added some simple boxes to the screen that represented the player and the sheep. 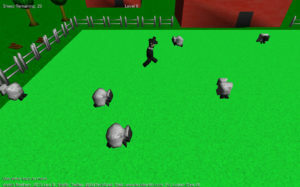 Then I developed a method for automatically generating the sheep, using the Prefab technique that I learned in the Unity tutorial. Next I started working on the model assets. I’ve been modeling simple objects in Blender for over ten years, so I knew I could make a player model and sheep model for this competition. The only problem was adding the models into Unity was something I had never done before. I’ve gotten animated models working in XNA before by exporting to FBX, but I never had the ability to change animation sequences. I was delighted to discover that importing models into Unity is as simple as dragging the .blend file into the Unity project. Unfortunately, my models were not animating in Unity, which had me pulling out my hair for awhile. After some searching on the Internet, I found that the Animation Type must be set to “Legacy” on the Rig tab for animations to work. Then I created a simple barn, trees, and fence to add to the scenery. Finally, I rendered a stack of potatoes as a small Easter egg, which can be seen on the left side of the farm. For the audio, I recorded myself reading the introduction story using Audacity. I also made a “baa” sound, which I sped up and raised the pitch in Audacity to make it sound more like a sheep. Finally, I needed some music so I recorded myself playing “Old MacDonald” and “Baa Baa Black Sheep” on the guitar. I thought those songs fit the atmosphere of my game perfectly. The level design was really simplistic, as I just increased the number of sheep for each level. Some have expressed dissatisfaction due to the lack of a lose state. However, not all games have lose states. In a racing game, you can just sit in your car forever and never reach the finish line. I feel my game is a lot like bubble wrap. You just keep popping bubbles until they’re all gone. Adding enemies such as snakes and obstacles like briars did cross my mind, but I envisioned this being a game for the entire family, so I wanted to avoid having the main character get killed. I also wanted to make mazes out of the fence, but I knew I wouldn’t be able to compete that within 48 hours. Finally, I made a victory screen and congratulations message for when the player completes all ten levels. So that’s Amish Brothers in a nutshell. I would like to expand the game a little more to make it more interesting, but I also have a few ideas for other games I would like to start making with Unity as well. Follow me on Twitter at @GaTechGrad or visit my website www.levidsmith.com for my other projects.